The Black Sands Fire Pit Set pairs the Black Sands Fire Pit with four of the barrel chairs from the Black Sands deep seating offering. The four chairs each sit on a swivel for convenience and practical use. They feature cast aluminum frames finished in deep umber and soft gold undertones. The cushions are all-weather, and you may choose the cushion cover fabric patterns from a huge selection of Tommy Bahama all-weather fabrics. The four tub chairs gather around the Black Sands Fire Pit, which features an ornately decorated tabletop. Travertine with dark and light emperador marble pieces all interweave in a diamond and serpentine pattern. The earthy tones compliment the deep umber frames of the tub chairs. The fire pit can run on either liquid propane or natural gas, and it ignites with the flick of a switch. Tommy Bahama furniture can help you to truly relax, even while entertaining. 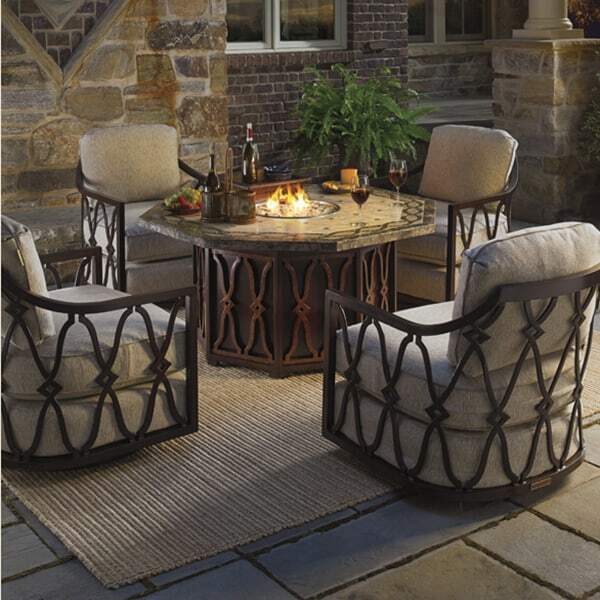 Find the perfect combination of pieces in their expansive offering of outdoor furniture!